I’ve seen this book reviewed on quite a few blogs recently and it sounded so good that I couldn’t resist buying a copy. Hasn’t it got a gorgeous cover? I’m such a big music fan, and my husband collects records so we always have great music on in our house. This book showed up in an Amazon Recommends emails and it just sounds so good that I had to get a copy. I’m still enjoying a lot of non-fiction at the moment so I will definitely be starting this one soon. I’ve been wanting to read this book for ages as it sounds like such a fascinating novel. I was thrilled to see my pre-order appear on my Kindle on Thursday. I really hope to read this soon but want to be sure to start it on a day when I have lots of time to read so I can just let myself be engrossed in it. I loved Christobel Kent’s previous novel The Crooked House so this new novel was a must buy for me. I’ve seen this book talked about a lot recently and it sounds like a good read so I’m keen to read it. This book has been on my wishlist since before it was released but somehow I hadn’t got around to buying a copy. I spotted it again recently and decided to treat myself. I think this will be a book where I can identify with it to a degree so it’s another one that I want to save for when I’m able to concentrate better and can read in big chunks. This was an impulse buy as I liked the sound of the synopsis, hopefully I was right to take a chance on it. I completely forgot that I’d had this on pre-order so it was like past me had send present me a gift when it appeared on my Kindle as if from nowhere. I can’t wait to read it. I’ve been wanting to read this book for a while so when I spotted it for £2.99 I couldn’t resist grabbing a copy. It sounds like a fun read with a bit of depth to it so I’m keen to read it soon. This was another impulse buy when I read the synopsis as it just sounds so good. I definitely want to read this book before too long. I’ve found Lisa Scottoline’s novels to be a bit hit and miss – some of her books are really good but others have fallen flat for me. I decided to give this one a go based purely on the synopsis as it sounds brilliant. I’ve since seen other reviewers rate it highly so I’m excited to read it. I’d never heard of this book before but I entered a giveaway to win a copy as it sounded good. I didn’t win the giveaway but when I saw the kindle version of the book on offer for £1.99 I treated myself. This book is 99p on Kindle so I bought it after the title made me smile. I’m expecting this to be a quite light-hearted look at the way music has affected this man’s life, I’ll probably read this quite soon. I was super excited to be approved for a copy of this on Net Galley this week! I love Sharon Bolton’s novels, they’ve all been such brilliant reads and I’ve been keenly awaiting this new one. I’ll definitely be reading this one very soon! I happened to see this on Net Galley, the cover really caught my eye. I read the synopsis and it sounds like such a fascinating read so I was thrilled when I got approved. The book’s not out until September so I need to try and resist reading this for a little while but I’m not sure I’ll be able to hold out for long! I love Marcie Steele’s novels so there was no way I could resist requesting a copy of her latest! I completely and utterly adored Holly Martin’s two Christmas books last year so was very excited when I heard there was to be a summer book based in the same location. I’ll definitely be reading this book very, very soon! I’ve read a lot of great reviews of Bloq recently so when Alan Jones contacted me to offer me a review copy I was thrilled. I was also thrilled to be offered a finished copy of Everyone Brave is Forgiven by Chris Cleave last week. My copy arrived last weekend and it’s gorgeous, look at the red sprayed page edges! I really hope to feel well enough to be able to read again soon so that I can start this. This entry was posted in Book Meme, Books, ebooks, Stacking the Shelves and tagged Alan Jones, Books, Camille Perri, Chris Cleave, Chris Whitaker, Christobel Kent, David Hepworth, ebooks, Gae Polisner, Holly Martin, Jamie Jones, Joanne Macgregor, Kathryn Flett, Lesley Allen, Lisa Scottoline, Lucy Lawrie, Marcie Steele, Peter Gardos, Rachel Elliott, Sharon Bolton, Yvette Edwards. Bookmark the permalink. Another great haul – glad to hear you have Daisy in Chains and I may well choose the Yvette Edwards as I read her book, A Cupboard Full of Coats a few years back, it was very good! Ooh, I read and enjoyed A Cupboard Full of Coats too – I didn’t click that it was the same author! I’m looking forward to The Mother even more now. I was very pleased to get approved for Daisy in Chains, I can’t wait to read it. I’m looking forward to reading Bloq as it seems to be getting a lot of great reviews. I can’t wait to read Daisy in Chains, I love Sharon Bolton’s novels. So many great books! I also bought The Lonely Life of Biddy Weir and can’t wait to read it. Enjoy reading your new books :). It sounds like such a good read, doesn’t it? I had a big spending splurge on books this week, I was feeling really down and powerless to resist these books. I’m looking forward to reading them all. Another week another great haul! I haven’t seen most of these about, I’ve been hearing a lot about Bloq and The Second Chance Shoe Shop so these are creeping up my radar! I have Summer at Rose Island aswell and am lucky enough to be on the blog tour for that one so its on my reading list in a few weeks time to be ready. 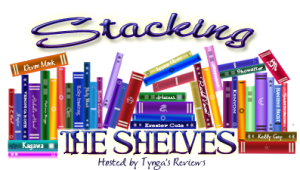 I’ve enjoyed these posts on your blog so much recently I’ve decided to take part in Stacking the Shelves myself and have put my first post up today! EEEK! A lot of your books are new to me this week. I hope you love all of your books. Oh my goodness, Hayley! Yet another fantastic haul for you this week! most of your books are new to me, but they look so good. I hope you’ll enjoy them all. Thank you. I had a bit of a spending spree on books this week as I needed cheering up. I’m excited to read them all now. I’m looking forward to starting Most Wanted, it does sound good. Thank you. Well I just added a bunch of books to my wish list. lol I somehow haven’t heard of any of these before. I hope you enjoy them all. Thank you, I’m looking forward to reading them all. I hope you enjoy the ones that you added to your wishlist. Memory of Things and Summer on Rose Island look really good.